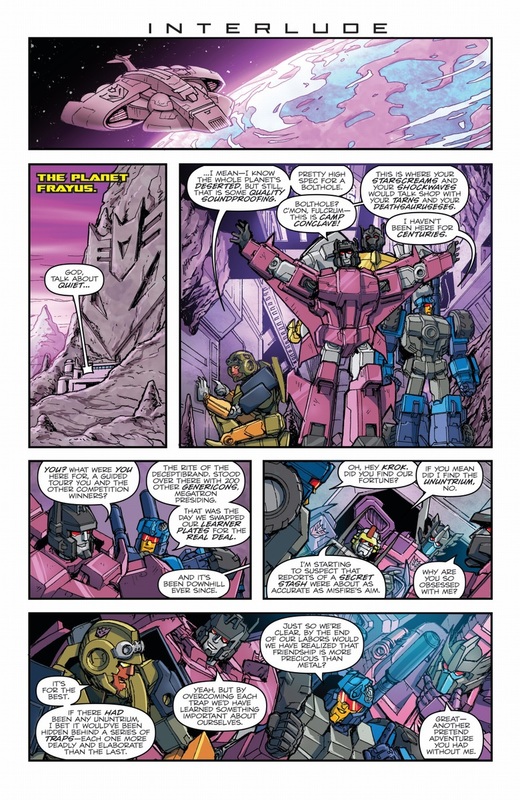 scans_daily | Transformers: Lost Light #12 - "The Plotters' Club (Part 3): Journey's End"
God, I hope Getaway gets what’s coming to him. He needs to die. Painfully. And the scans don't even show the most horrible thing he does, either. I did like the interlude with the scavengers in this story though. But by the end of that issue, everyone's in trouble of some sort. Except Getaway, dammit. Maybe. He's found a mysterious planet that he thinks is Cyberutopia. Speculation though (Rot13'd for possible spoilers): Jr'er gbyq Havpeba vf znxvat n shyy cynarg rngvat ragel vagb pnaba. Fb, urer'f ubcvat gung vg vf gur npvq cvg sbe Trgnjnl. 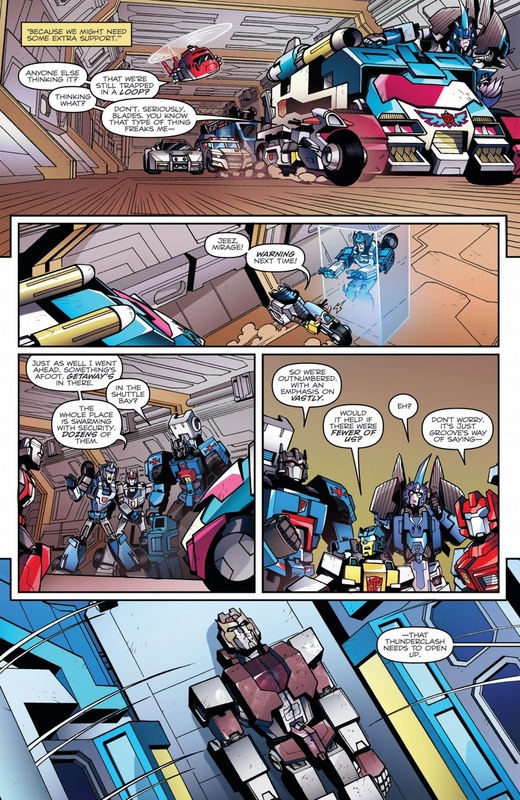 While part of me wants to see Rodimus get his revenge, I'm mostly hoping the Knights are the Quintessons and they just feed Getaway to the Sharkticons. 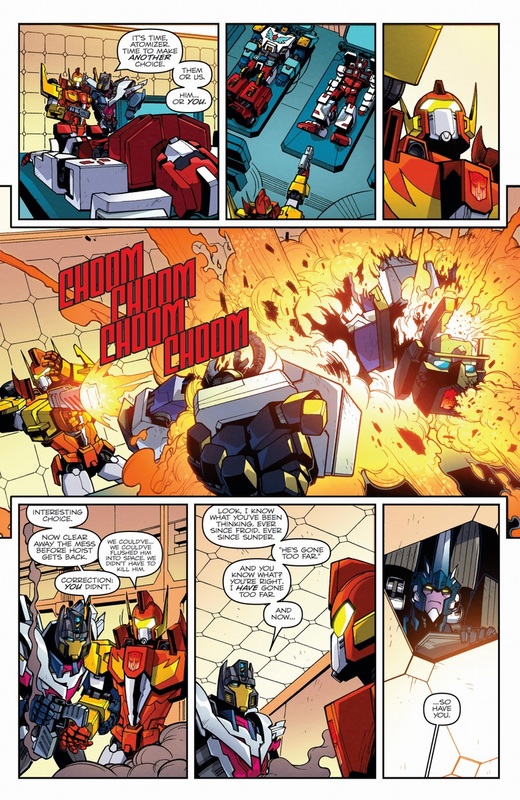 Or better yet, maybe due to a time paradox, the planet they find is actually Pardon, and Getaway sets foot on it seconds before Rodimus has it blown up. The only thing I didn't like about this issue, apart from Getaway but that is intentional, was the mechanism they used for making Riptide immune to the "Nudge Gun" and its memory altering effect, I felt that was treading on borderline offensive ground. Apparently he was of too low intelligence for it to work on him. That seems somewhat distasteful as an explanation, to me anyway. Ought just to have said he was immune and left it at that, to me anyway. Riptide did survive though, he managed to transform and shot around very fast underwater until Getaway had left then he shot out of the robot piranha tank and went and freed everyone else. Before I read the Mutineers Trilogy, I had anticipated that I'd hate Getaway even more by the end of it (and did I ever.) However, I was surprised to find myself also pitying Getaway as well. For all his ambitions and the reprehensible steps he's taken to achieve them, he's really little more than a puppet of Froid and Sunder at this point. I anticipate very awful things on the horizon for Getaway. I'd hardly cal Getaway a puppet to Froid. Froid's tactics are overt and obvious. Getaway is a skilled personal manipulator, too skilled, IMO, to fall for Froid's tactics if he truly cared to. Rather, Getaway is (figuratively) leaning into the blows because he believes he is right. As for Sunder, I don't believe we've seen any indication that he's worked his mojo on Getaway. He seems content to be lazy about how he gets fed. Oh, I agree, Getaway does bear the greatest responsibility, which I believe proves my point in a way. While Getaway is a skilled manipulator, he's in a more dire situation than when he was plotting the mutiny. The other mutineers were getting wise to his lies, and his scheme was in jeopardy when the Rod Squad contacted the Lost Light and the Galactic Counsel refused to co-operate with him. He was driven to such desperation that he was finally willing to get his own hands dirty, and it's a desperation that Froid and Sunder are all too happy to exploit. Froid isn't being too subtle, but he doesn't really need to be. He knows he has Getaway over a barrel, and has used that position quite effectively. His personal motive in all this is to study Getaway's behaviour as he carries out his schemes. Froid doesn't have to do anything beyond negotiating a price for Sunder's services. Otherwise, he can just sit back and enjoy the show. As for Sunder, I never meant to imply that he worked any kind of mojo on Getaway, but he is still using him. Also, I would argue that Sunder is extremely peculiar about how he's fed, given how he wanted to preserve the life cords Getaway had to harvest for him. Worse yet, I'm pretty sure Getaway himself is on Sunder's menu. It's like Froid said about Sunder's particular appetite; "The darker the memory, the sweeter the taste. And the sweetest memories, those are the ones we lock away. The ones we bury." Sunder may enjoy his life cords, but the taste of your average Autobot's darkest memories would no doubt pale in comparison to those of Getaway. The more Getaway kills or screws up, the more life cords he has to acquire to get Sunder to cover up for him, thus the more Getaway "marinates" in his own guilt. It's really the only reason I can think of why Sunder doesn't just rampage throughout the ship like the last time. Getaway may think he's ahead of the game, but he's been dancing to Froid and Sunder's tune since he recruited them. 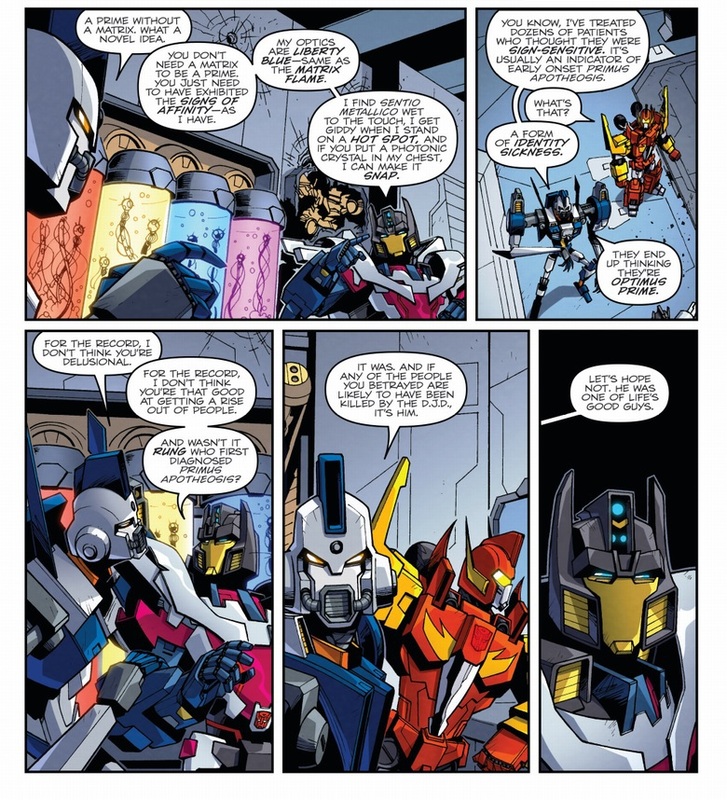 I like how how Getaway really thinks he, who's done all this much, deserves to be Prime- and how that's directed, not at Rodimus, who had his chance and obviously blew it, whatever, but did legit get the matrix, but much more at Thunderclash, who speaks oh-so-morally but merely held the Matrix without it reacting to him at all like even Rodimus had. And how he pretty much never mentions Optimus himself- the one who brought legitimacy to the title. Froid came into things very late, and gave a few nudges, but the nudges only worked because Getaway has this inferiority complex and flat-out grudge against those who get respect and popularity and was already making so many compromises because he's really not a big scale planner, he's an operative who's used to winging it. And back when with Skids and such, he'd try and peel away friends from others then too, so he's always shown some sign of this driving jealousy. 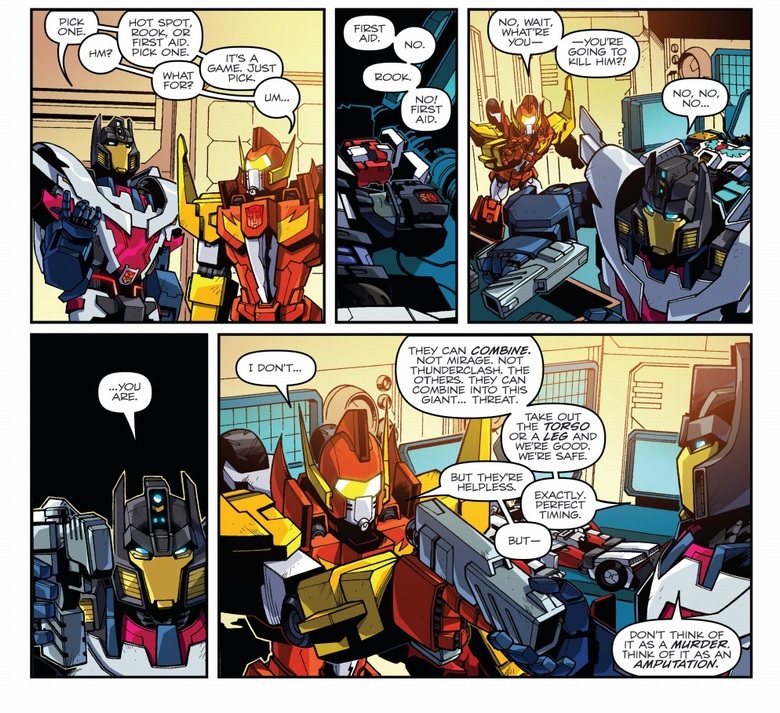 And sidenote, I asked Roberts at one point whether he's thinking of using this legitimacy to try and displace Starscream and whether he's jealous of Starscream being where he wants, and the answer is basically he's so far out of the loop that Starscream's just a Decepticon villain to him and he doesn't really know the current politics. He's focused on Thunderclash, and control, and winning, and the actual ruler of cybertron (as far as he knows) is barely in his plan book at this point. 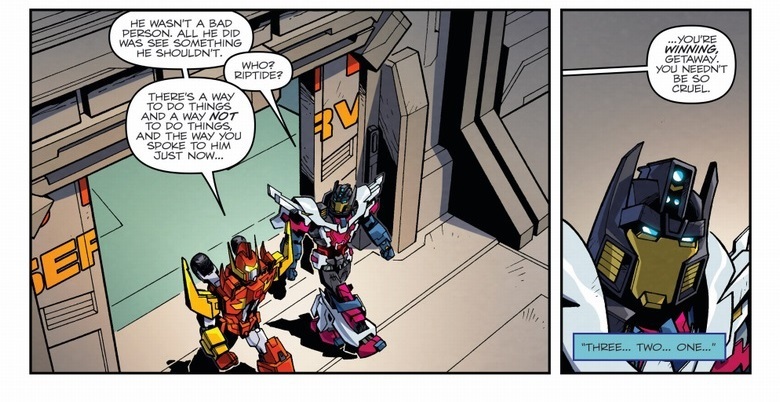 I like how Froid's a lot more complicated than Getaway realizes (while still being a sadistic puppy). Hate that they killed Rook -- the guy's got practically no fiction to his name, being the new guy in the team and all. And weird they'd dig up Ambulon when Mirage is right there and Combiner-compatible. Doesn't Mirage turn into an arm, not a leg? Unless IDW is doing something different, they should be able to form either. But this issue was a mess. For starters, the explanation of how Riptide was immune to the Nudge Gun was just poorly done. We've seen the nudge gun fail to work on bots with damaged brain modules before, that could have been referenced without making fun of Riptide for it. Then there's Rook. Actually, Defensor as a whole really, although Rook was just the most blatant. The characters Roberts hasn't regularly written get easily one-shot to prove just how dangerous the bad guys are. 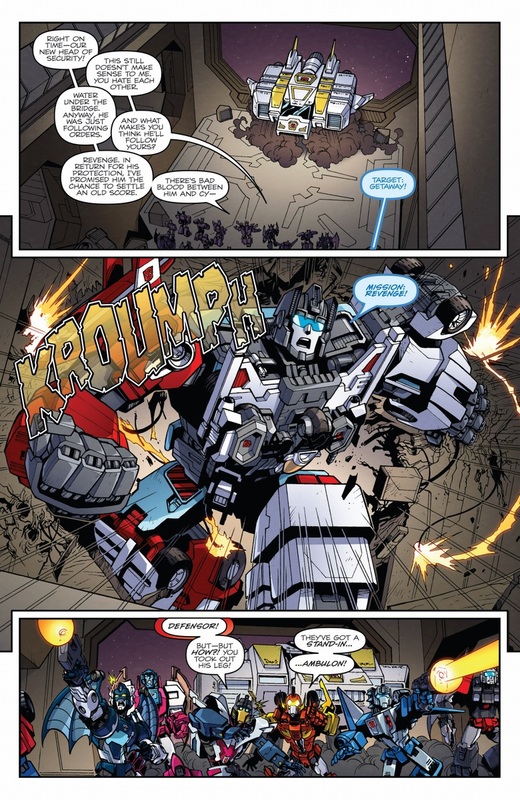 It's even worse here, given how much of the fandom was looking forward to Defensor vs the Mutineers, not for the curb stomp value, but the honest story potential. Hell, I was hoping that the mental link Enigma-created Combiners got was going to be part of how they escaped the mental loop Getaway trapped them in. But nope, Defensor gets slaughtered by Star Saber (WHY IS HE EVEN THERE?!) and then all the team except First Aid are brutally murdered by the brainwashed Autobots. 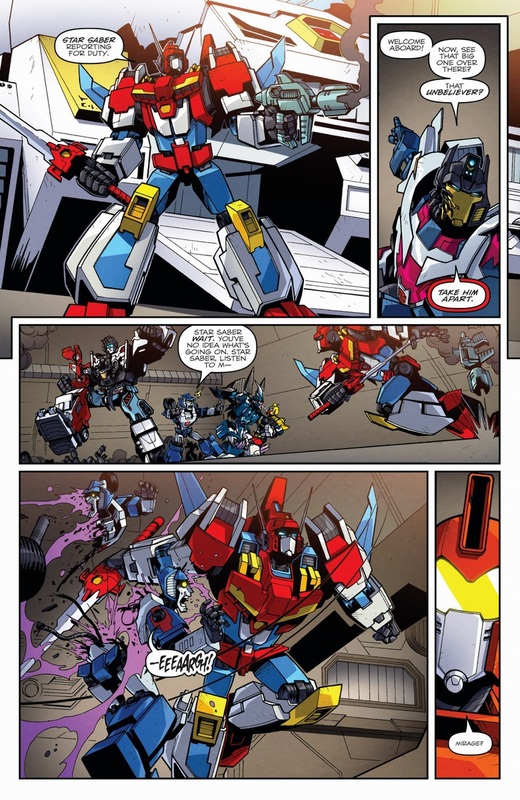 Atomizer starts to get a redeeming moment, and then Getaway brutally murders him.